MAXAM 100 is the best telephony system device to be used in small business companies. 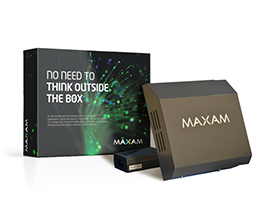 MAXAM 100 uses only SIP and IAX2 protocols without FXO and FXS interfaces. MAXAM 206 Hybrid is a solution for small companies that are using 2 Land Lines and up to 6 FXS telephones. MAXAM 206 can also run SIP and IAX2 Extensions and Trunks. MAXAM 800 Hybrid has a Quad Core ARM processor for higher business companies. It has 8 Land Line interfaces and uses SIP and IAX2 Extensions and Trunks.